You can connect your System Center Configuration Manager environment to Azure Monitor to sync device collection data and reference these collections in Azure Monitor and Azure Automation. Azure Monitor supports System Center Configuration Manager current branch, version 1606 and higher. The following steps summarize the steps to configure Configuration Manager integration with Azure Monitor. In the Azure portal, register Configuration Manager as a Web Application and/or Web API app, and ensure that you have the client ID and client secret key from the registration from Azure Active Directory. See Use portal to create Active Directory application and service principal that can access resources for detailed information about how to accomplish this step. In the Azure portal, grant Configuration Manager (the registered web app) with permission to access Azure Monitor. 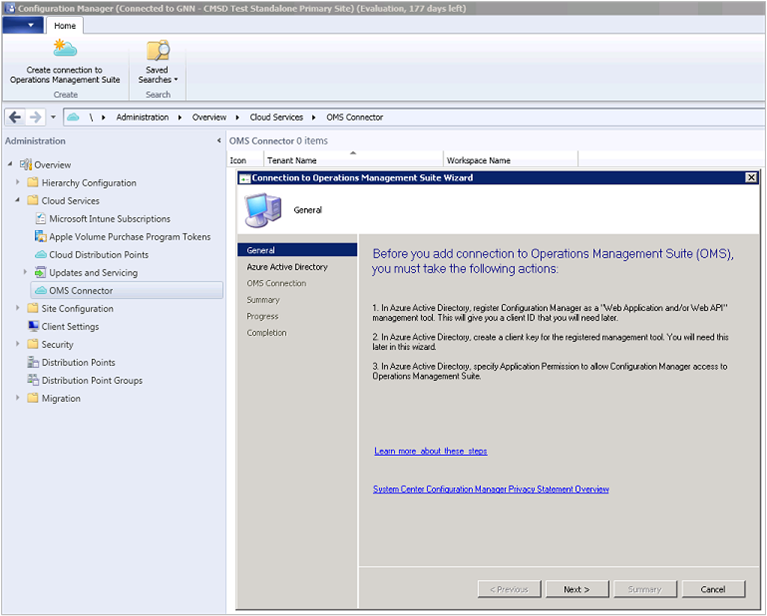 In Configuration Manager, add a connection using the Add OMS Connection Wizard. In Configuration Manager, update the connection properties if the password or client secret key ever expires or is lost. Download and install the Microsoft Monitoring Agent on the computer running the Configuration Manager service connection point site system role. The agent sends Configuration Manager data to the Log Analytics workspace in Azure Monitor. In Azure Monitor, import collections from Configuration Manager as computer groups. In Azure Monitor, view data from Configuration Manager as computer groups. You can read more about connecting Configuration Manager to Azure Monitor at Sync data from Configuration Manager to the Microsoft Log Analytics workspace. In the following procedure, you grant the Contributor role in your Log Analytics workspace to the AD application and service principal you created earlier for Configuration Manager. If you do not already have a workspace, see Create a workspace in Azure Monitor before proceeding. This allows Configuration Manager to authenticate and connect to your Log Analytics workspace. You must specify permissions in the Log Analytics workspace for Configuration Manager. Otherwise, you receive an error message when you use the configuration wizard in Configuration Manager. In your list of Log Analytics workspaces, select the workspace to modify. From the left pane, select Access control (IAM). In the Access control (IAM) page, click Add role assignment and the Add role assignment pane appears. In the Add role assignment pane, under the Role drop-down list select the Contributor role. Under the Assign access to drop-down list, select the Configuration Manager application created in AD earlier, and then click OK.
Review the article Connect Windows computers to Azure Monitor in Azure to understand the methods available for installing the Microsoft Monitoring Agent on the computer hosting the Configuration Manager service connection point site system role. In order to add Log Analytics connection, your Configuration Manager environment must have a service connection point configured for online mode. 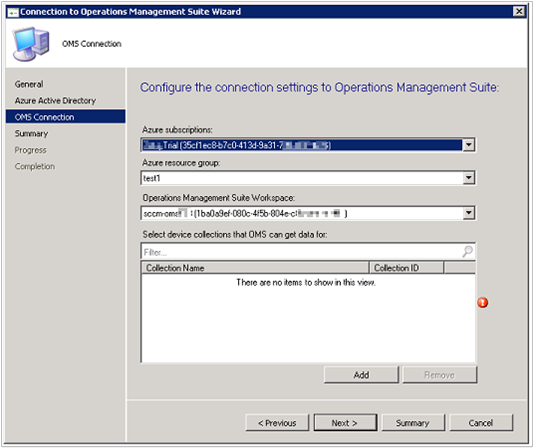 In the Administration workspace of Configuration Manager, select OMS Connector. This opens the Add Log Analytics Connection Wizard. Select Next. OMS is now referred to as Log Analytics which is a feature of Azure Monitor. On the General screen, confirm that you have done the following actions and that you have details for each item, then select Next. In the Azure portal, you've registered Configuration Manager as a Web Application and/or Web API app, and that you have the client ID from the registration. In the Azure portal, you've created an app secret key for the registered app in Azure Active Directory. In the Azure portal, you've provided the registered web app with permission to access to the Log Analytics workspace in Azure Monitor. On the Azure Active Directory screen, configure your connection settings to the Log Analytics workspace by providing your Tenant, Client ID, and Client Secret Key, then select Next. The wizard connects to the Log Analytics workspace using the information you've input. Select the device collections that you want to sync with the service and then click Add. You must connect the top-tier site in your hierarchy to Azure Monitor. If you connect a standalone primary site to Azure Monitor and then add a central administration site to your environment, you have to delete and recreate the connection within the new hierarchy. After you have linked Configuration Manager to Azure Monitor, you can add or remove collections, and view the properties of the connection. If a password or client secret key ever expires or is lost, you'll need to manually update the Log Analytics connection properties. 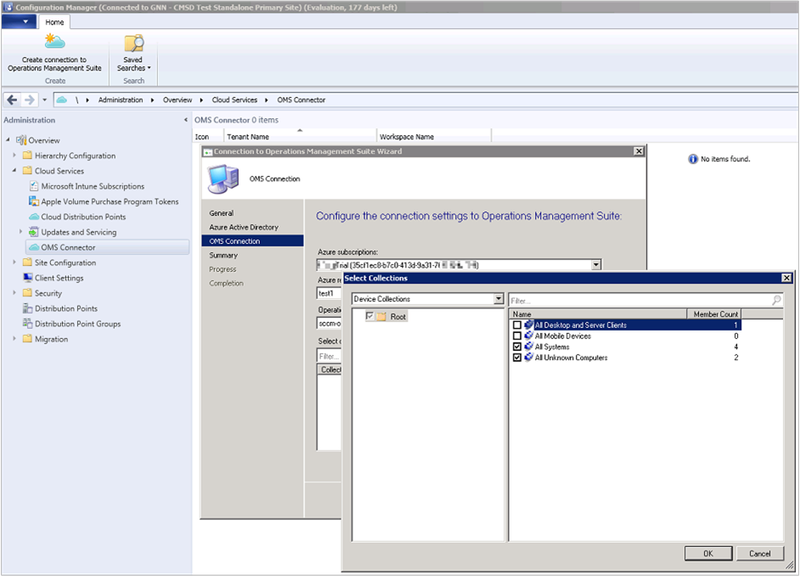 In Configuration Manager, navigate to Cloud Services, then select OMS Connector to open the OMS Connection Properties page. On this page, click the Azure Active Directory tab to view your Tenant, Client ID, Client secret key expiration. Verify your Client secret key if it has expired. After you've added a Log Analytics connection to Configuration Manager and installed the agent on the computer running the Configuration Manager service connection point site system role, the next step is to import collections from Configuration Manager in Azure Monitor as computer groups. After you have completed initial configuration to import device collections from your hierarchy, the collection membership information is retrieved every 3 hours to keep the membership current. You can choose to disable this at any time. In the Azure portal, click All services found in the upper left-hand corner. In the list of resources, type Log Analytics. As you begin typing, the list filters based on your input. Select Log Analytics workspaces. In your list of Log Analytics workspaces, select the workspace Configuration Manager is registered with. Select Computer Groups and then select SCCM. Select Import Configuration Manager collection memberships and then click Save. After you've added a Log Analytics connection to Configuration Manager and installed the agent on the computer running the Configuration Manager service connection point site system role, data from the agent is sent to the Log Analytics workspace in Azure Monitor. In Azure Monitor, your Configuration Manager collections appear as computer groups. You can view the groups from the Configuration Manager page under Settings\Computer Groups. After the collections are imported, you can see how many computers with collection memberships have been detected. You can also see the number of collections that have been imported. When you click either one, Search opens, displaying either all of the imported groups or all computers that belong to each group. Using Log Search, you can start in-depth analysis of Configuration Manager data. Use Log Search to view detailed information about your Configuration Manager data.